Words and music: Janice Kapp Perry, b. 1938. (c) 1980 by Janice Kapp Perry. I walked into the Denver Temple, hand in hand with my fiance, my mom and dad just a few steps ahead of me…I was ready. I had been found worthy. I had a temple recommend in my pocket, and I was going to cross over from a child in preparation, to a grown woman. I would be making covenants with Heavenly Father, participating in what I had been taught since birth, would be the most sacred, beautiful, spiritually powerful experience of my life. They don’t really tell you WHAT is going to happen in there… WHAT the ceremonies are really like. They do not define the kinds of promises and oaths you will take. It is spoken about with reverence and hushed tones and vague references to spiritual wakefulness and glory and sacred duty. I walked in filled with anticipation and readiness, I was finally going to be a part of the inside, I would at last be able to feel the tremendous spiritual affirmation that I was going to be ok. That I was doing the right thing. That love will conquer all, the naive mantra of so many twenty-somethings…Rick would be in there to share this experience with me, support me as I went through my initiatory and endowment ceremony. When I came out, my heart thunked slowly and heavy in my chest. One clammy hand held tightly to Rick’s, the other to a sack of new underwear. I strained to feel the spiritual aliveness, the glow I had been promised. I was terrified. I could not process the experience quickly enough to match the lightness in Rick’s stride. It was just a week before we were to return to a mormon temple to be sealed for time and all eternity. I fought the sting of tears in my eyes as we climbed into the car, and I positioned my new purchases, small plastic packages filled with white bottoms and capped sleeve tops that would be my new normal, a reminder of this night’s covenants with God. I rubbed the rolled edge of the garment bottoms through my jeans as Rick started the car. My parents waved proudly, big smiles on their faces, as they drove out of the parking lot. “So! You did it Meg! How do you feel?” He looked imploringly into my eyes, as he had done in the celestial room of the temple, trying to read me, feel out my reaction. He knew I was scared. I knew that as a mormon couple, we would live with a constant expectation to return to the temple regularly and perform the same rituals, over and over, in the stead of all the people who had died without the glorious privilege of participating in the ceremonies on earth. I knew that my zealous, return missionary, soon to be husband, would want to do what was expected. “I never want to do that again,” I whispered quietly into my lap, tears pooling in my eyes. I stared at my hands, concentrating on not blinking them out. Rick squeezed my leg. I could feel his desperate searching for inspired words. “I love you, too.” I squeezed his hand and kissed him quickly. I wanted to grab him and tell him how scared I was, how terrified. I did not want to let him down. I wanted to be filled with spiritual fulfillment. The disappointment and distaste for my first temple experience after a lifetime of being told it was the most amazing, uplifting, magical experience was a crushing blow to my delicate faith. But I took some big breaths. I held my love’s hand in mine. 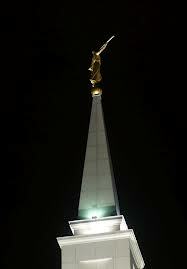 I stared at the golden angel Moroni, glowing in the cold January air at the top of the temple’s highest spire. He was blowing his horn, announcing his truth. I watched him in the rearview mirror as we drove away, becoming tiny and distant in the night sky.